This is the second part in a series of guest posts written by Moses Rifkin, a physics teacher at University Prep in Seattle, describing a unit he teaches to his senior physics students about social justice, privilege and institutional racism in physics. Moses will be speaking about this curriculum to the Global Physics Department on February 18. Can we say anything conclusive as the result of this research? Writing and discussion: beliefs about minority groups, American meritocracy, etc. Which hypotheses reflect a cause internal to the black community (different values, for example) and which are external (racial bias in hiring, etc.)? How do external and internal causes influence one another? What would it mean if our beliefs about groups weren’t as accurate as we thought? Do you think the number of black physicists will be proportional in ten years? Why? We are, I admit to the students, leaving the realm of hard science, of research and hypothesis. We talk about how we are generally taught to view things in terms of internal factors, that people in America end up where they deserve to end up. The notion of America as a meritocracy is one that they recognize in the culture around them, but I challenge them to think about what that means for groups that have been traditionally less successful. My goal is to help them see that the myth of meritocracy leads us to attribute characteristics to groups (“maybe black students are less motivated to do well”) as a way to explaining why they end up where they end up. We end up ascribing qualities to groups for reasons that are beyond their control, and if you believe that the playing field is level and fair, those beliefs become a self-fulfilling prophecy. I ask my students to consider these ideas, supported by data, and to consider that these external factors may be at least part of the explanation for why there are so few black physicists. My students have been taught to view racism in the sense of cross burning and lynching and, since those acts are thankfully less frequent today than in the past, many believe that racism is a thing of the past as well. The modern reality is much less clear, much more ambiguous than those acts of overt racism, and Day 2 is an attempt to lay some foundation for that discussion. This night marks the first night of optional reading, in which I ask the students to read one article from a wide range of resources I’ve assembled. As the in-class conversation pushes into areas that are less familiar or comfortable for them, I try to give them plenty of choice as to what related questions they explore. This arises in part from the fact that I have more resources to share than I can require them to read, and in part because I’ve found that having autonomy promotes students to buy-in even as the discussions are getting challenging. Day 2 Homework: read a short article about James Sherley (an African-American stem cell researcher denied tenure by M.I.T. who claimed racism played a part), read your choice of optional reading, and write in your journal. 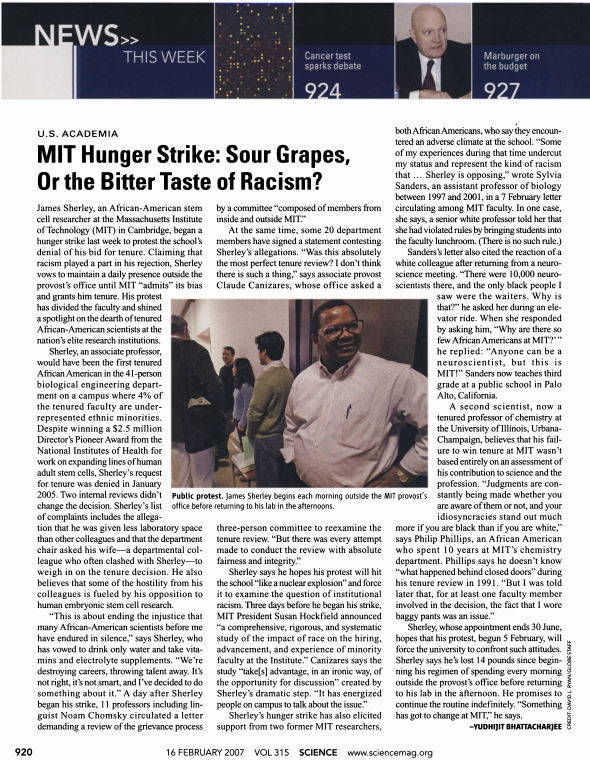 MIT Hunger Strike: Sour Grapes, or the Bitter Taste or Racism, Science News, Feb 2007. Class discussion: Do you think that the examples presented in the Sherley reading are racism? Can the cycle be broken? What has to happen to do so? Should we define racism by intent, or by outcome? What does racism look like today? Is America racist? Is our school community? In what ways will inequalities perpetuate themselves? In what ways will they change? Can you have racism when everyone is well-intentioned and politically correct? Just how racially integrated is America today? The Sherley story is, I’ve found, a really useful jumping-off point for discussion. Student opinions vary, generally, but they agree that they don’t have enough information to know. Was Sherley a bad researcher and just “playing the race card”? Or does the fact that just 4% of M.I.T.’s tenured faculty come from under-represented racial minorities lend credence to his claims? I make sure to point out to them that this is the world in which they now live: that they’ll never have ‘enough information’, and that they’ll frequently have to decide what to think about claims of racism without knowing the full story. How they view Sherley has a lot to do with how they define racism. In some ways, I think this day is the crux of the project, an attempt to move students from viewing racism as about individual acts of meanness towards viewing it more systematically. I’m definitely still working on how to do that gracefully, as I often just end up telling students that their definitions are incomplete and that they need to broaden them out; I’m still trying to find a way to help them see that for themselves. I recently saw the great documentary I’m Not A Racist…Am I?, which includes a powerful moment in which a teacher asks students whether eliminating all “racists” would fix things for racial minorities; the students all see for themselves that it wouldn’t, and their redefinition comes from that lightbulb moment. I’ll try that this year. Around Day 3, the students often start to feel pretty grim. I can’t blame them: they’re earnest and don’t want the world to be unjust, and I’ve spent the last day or two trying to lead them to see that in many ways it is. I tell them that this is about as grim as it gets, that there is better news ahead, and this isn’t just lip service: I’m always treading a thin line between being painfully honest but also not extinguishing hope. Every group has its own balance, and one other thing I’m trying to work on is listening carefully to find it and tweaking accordingly. The anti-racist author Tim Wise has been a great inspiration and resource for me as I learn to support this way of viewing race in America. He was the one who taught me to look for racism in whether the outcome was imbalanced; his statement that “to a white person, racism is viewed as an individual problem and colorblindness is the solution. To a black person, racism is systemic, present, and requires excavation” guides me and is one that I try to share with students. I mention him here both to share him as a resource and because I think it’s important for us educators to keep learning, and to find our own teachers who work for us. As a white person, it’s a little too easy for me to forget that I have more to learn, and so I’m glad to have Tim Wise and his writings to keep me honest. Day 3 Homework: read Peggy McIintosh’s “White Privilege: Unpacking the Invisible Knapsack”, read one of the optional choice readings, and write in your journal. Also: Seattle’s second-most famous rapper, Macklemore, addressed some of these same questions as McIntosh on his first album. 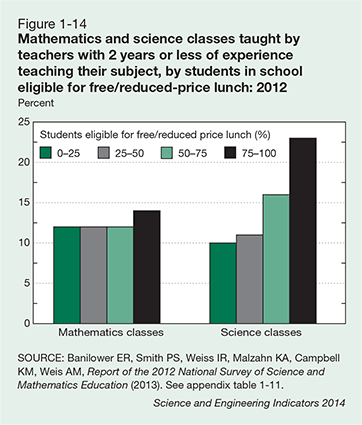 For some students, this is a better way in. Here’s the song, ‘White Privilege’, and the lyrics. The next post will cover days 4 and 5 of this unit, when students explore privilege and the Implicit Association Test.